Rogue Women Writers: WHO THE HELL IS RAISA JORDAN? I love this blog topic—discussing our personal relationships with the characters we create. It reminds me of a time when I was on the phone with a good writer friend, and we were talking about the protagonist in my thrillers—Diplomatic Security Service Agent Raisa Jordan. Suz (my friend): That scene will never work. Rae would never do that. Me: But she has to. It's the only way she can get the information. Suz: That may be, but you're going to have to figure out a different way for her to discover that they've got it all wrong. Me: Well, what if she kills so-and-so? Suz: No. There's no way that Rae would ever do that. Later, after Suz left, my then seven-year-old came into the kitchen. "Mommy, can I talk to you?" she asked. "Sure, honey, what do you need?" "Mommy, who is Raisa Jordan, and why did she have to kill somebody?" It was that moment when I realized just how real to me the characters in my book had become, and just how real they'd become to those I'd introduced them to. We had been speaking about them as though they were flesh-and-blood human beings. I wasn't the only one. ALL of my writer friends talked about their characters that way, too. I've heard Lee Child refer to his character, Reacher, as if he might be waiting in the bar. I've heard David Morrell call himself "Rambo's daddy." It's like my Rogue Sister, Sonja Stone, said: "You must know your characters, so that when they talk to you, you'll recognize their voices." It's also important to make sure that what your characters are doing is plausible—a tall order when you consider the things thriller protagonists do. Consequently, nearly every writer I know has spent some time reenacting a fight scene. Either alone in the office, or with a partner or friend, we've all spent some time in our character's shoes. How can we understand them if we don't walk a mile in their shoes? Sometimes it's fun. Sometimes it's scary. Sometimes it's sad. 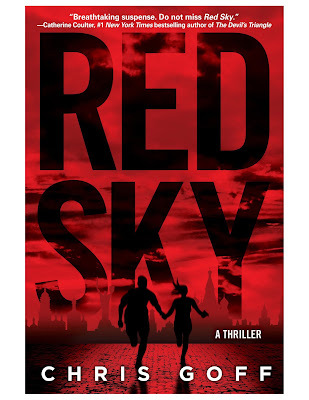 A year ago last May, my youngest daughter and I traveled to Ukraine on a research trip for my latest thriller, RED SKY. The experience left an impression. For example, in Kyiv, many of the people were torn in regards to the war with Russia. While they all seemed nationalistic and loved the sovereignty of their country, many of them had grown up under communist rule and had ties to Russia through family and friends. Most had spent time in Moscow or St. Petersburg visiting or going to school. As my daughter and I walked the streets, dined in the restaurants and watched the people of Kyiv, I tried to imagine how Rae would have seen it. For instance, would Rae have noticed that the men and women all dressed up, and went out each morning as if they were going to work, even though most of them didn't have jobs? Or, like my daughter, would Rae have noticed that all of the women and young girls wore spiked high heels? We're talking 3" heels and stockings, regardless of whether they were twelve or eighty. And how could she not have been struck by the difference between Kyiv and L'viv? In L'viv, the people were joyful. They dressed more casually, and had more money to spend. There was laughter, and dancing in the streets. And there's no way Rae could have missed the fact that with each course of the five course meal in L'viv came a shot of Vodka—all different flavors—and the waiters would gladly pour you a double. But would she have bought one of the rolls of toilet paper printed with Putin's face being sold in the outdoor market? Just as it's impossible to know exactly what anyone else thinks, it's impossible to know how a character feels about any given situation. But, you can imagine. For instance, I don't know how Rae felt losing her father as a young child, but I do know how it feels to lose a parent, and I've seen its effect on others firsthand. My mother's father died when she was nine years-old. Twenty-three years later, when I was around seven, I vividly remember finding her sobbing her heart out in the bathroom. When I asked her what was wrong, she fought for a smile to reassure me, and said, "It's okay, honey. I just miss my daddy today." By the time I've finished a book, my characters feel like old friends. And just like old friends, I am forever learning new things about them. But then, circling back, once they become real, there are some things that are set in stone. No matter how much I might want them to do something, if it's out of character, there's just no way! It's scary when you realize that a product of your imagination has become real to you. Scary...and wonderful. Oh Chris, how true that characters become so very real to us with special traits, fears, observations, reactions. I recall going to workshops at our International Thriller Writer conferences and hearing about how each major character in a thriller needs his/her own GMC - Goal, Motivation, Conflict -- and with your incredible travel and extensive research you have certainly created characters with all of that.. .and then some. Thanks for a great post. I loved the parts where you wondered whether Rae would notice what you or yoyr daughter was noticing. The question alone invites intimacy. Rae is a phenomenal character, and like you in so many ways! Chris, what a touching post! Your writing always reveals an endearing vulnerability--that's not easy to do (I haven't figured it out yet!). I laughed at the argument you and your friend had about your character. I've had that same argument, and I'm always tempted to say, "I created her! She'll do what I tell her to do!" :D It's not true, though is it? And what a compliment that our readers know our characters so well they are willing to argue on their behalf!